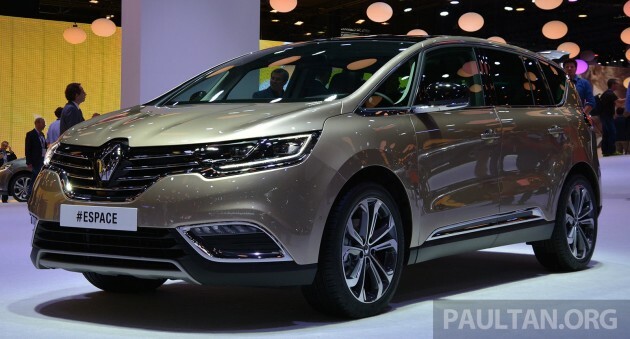 Unlike the usual motor show stand where carmakers display every piece of metal they have, Renault’s unique Paris 2014 “space dune” display had one undisputed star – the new Renault Espace. A school of colourful Twingos and the EOLAB concept aside (literally at the edges of the stand), it was all about the Espace, with several units of the MPV turned crossover sitting on little hills. The Espace was a pioneer of the MPV genre when it debuted 30 years ago, and the people mover has been a success over the decades for Renault, which shifted over 1.25 million units over four generations. But the big MPV is out of fashion now. According to IHS Automotive, European sales of big MPVs such as the Espace, Ford S-Max, Volkswagen Sharan and Mercedes-Benz V-Class, just to name a few, dropped 45% to 230,800 units in 2013. Renault sold just around 8,400 Espaces last year; something also to do with the MPV’s age no doubt. Many in the market for a big family car are shifting to SUVs, and that’s the segment the new Espace is trying to cross over to, pun intended. Seen it before? That’s because the production Espace is a faithful reproduction of the Initiale Paris concept from Frankfurt 2013. It’s a big car at 4.85 m long (for both five- and seven-seat forms) and 1.87 m wide, with a generous 2.88 m wheelbase that’s 16 mm longer than the old Grand Espace’s. The crossover however sits 63 mm lower than the MPV, and has a high waistline and ground clearance to emphasise the SUV theme. The standard wheel range goes up to 19 inches, with 20-inch rims on the options list. It may be a crossover now, but Renault boss Carlos Ghosn proclaimed at the unveiling that the new Espace will continue to provide the nameplate’s “warm and welcome interior, bathed in light” like the original. That’s will be deliverd by a 2.8 square metre “Lumiere” panoramic windscreen that incorporates a fixed glass roof over the front seats. A panoramic roof is optional. Sitting on the Renault-Nissan Alliance’s CMF (Common Module Family) platform, the new Espace is up to 250 kg lighter than the old Grand Espace, and the significant reduction is evenly split between the body, chassis, powertrain and equipment, Renault says. Aluminium is used for the doors and bonnet, Noryl plastics for the front wings and thermoplastics for the tailgate. Renault’s new flagship can be had with three downsized 1.6 litre turbo engines – the Energy dCi 160 twin-turbo diesel (160 hp, 380 Nm, six-speed EDC dual-clutch), Energy dCi 130 diesel (130 hp, 320 Nm, six-speed manual) and the Energy TCe 200 petrol from the Clio RS hot hatch, which has 200 hp, 260 Nm and a seven-speed close ratio EDC dual-clutch ‘box. All three engines feature stop start and brake energy recovery. All measures combined, the new Espace is over 20% better in fuel consumption and CO2 emissions. By the way, the Efficient Dual Clutch ‘box employs shift-by-wire control, and the absence of mechanical linkage allowed Renault to implement the floating console and ‘aviation-style’ gear lever you see above. The Espace boasts an “orchestra conductor” called Multi-Sense. 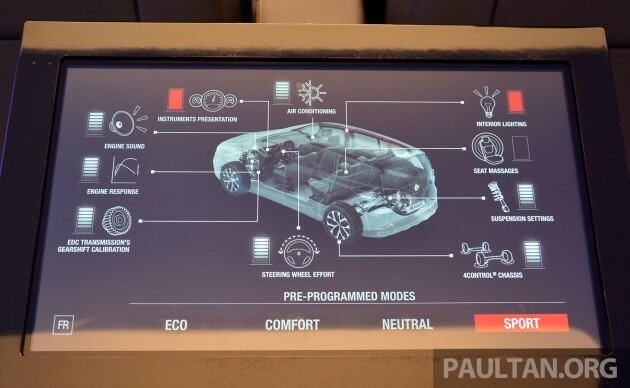 With four preset modes (Eco, Comfort, Neutral, Sport) and a configurable Perso mode, it manages the car’s engine response, 4Control four-wheel steering, steering weight, gearbox calibration and dampers. 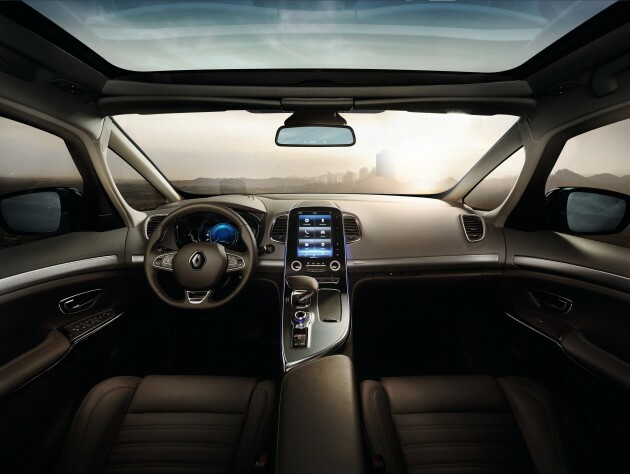 Together with the above, choosing a mode also alters the in-car ambience. Things that change are the ambient lighting (green, blue, white, red, purple), instrument panel colour and content, engine sound, front seat massage settings and climate control. Multi-Sense can be controlled via the long R-Link 2 touchscreen or an iDrive style rotary knob located between the gear lever and electronic parking brake. Other notable kit include a 12-speaker Bose Surround Sound system (with subwoofer and Centerpoint 2 tech), Ford Kuga-style foot triggered tailgate (opening angle can be set) and an impressive automatic seat folding system. The latter can be controlled via the touchscreen or from a button panel in the boot. Simply choose the formation you want, hit the button and voila, the chairs fall like dominos! The choreography happens irrespective of head rest positions. The Espace may no longer look like an MPV, but this is one cool MPV trick others should take note of. Alas, there are no plans for a right-hand drive version of the Espace for now, as the UK is not expected to deliver sufficient volume to make RHD conversion viable (previous car was discontinued there in 2011). It also means that this interesting vehicle won’t be available in Malaysia via official distributor TC Euro Cars for the foreseeable future. Ghosn let slip that a new Renault D-segment sedan will surface next year as part of the marque’s big car renewal programme; if the new Espace is a sign of things to come, we can expect a uniquely styled and innovative “new Laguna” to challenge the Peugeot 508 and Ford Mondeo pretty soon, if RHD is available. It maybe out of fashion in Europe but in Malaysia, where people are encouraged to pro-create and get more than 5 kids, this MPV will do well. It will do well in any society where men are encouraged to get more wives and have more children. That is why MPV laku in Malaysia. what’s so crossover about this? the ugly unser,avanza & innova looks more crossover than this. Yes… this is nowhere close. It’s just another van. crossovers are hybrids of suv and something else like the v40 cross country, merc gla, bmw x1, audi q3 etc… these cars have off road capabilities due to its suv gene & are said to handle like a normal sedan due to its not so high centre of gravity and suspension set up… this van can’t even go off road. That’s funny, cause the Cross Country is nothing but a hatchback that was raised slightly and got a few unpainted plastic bits. And how is the Mercedes GLA a crossover, and the Mazda 3 isn’t? They look pretty similar. It’s a hatchback. I’d like to see your “crossovers” go offroad… a dirt cheap Lada Niva will have vastly superior off road capabilities, or a Dacia Duster. What a good looking car! But the Renault bran not so common here and the service centre is less and less, no high hope that the car will arrived here with reasonable price tag. Well, then one can lay blame on TC for not properly promoting and marketing the brand. I like how they are promoting the motorsports aspects of the Renault Sport cars, but everyone knows they need to also promote thier bread and butter cars as well. The Fluence is dead in the water before it started. I’m wondering how many they managed to sell since they launched it. The Fluence doesn’t sell well, you can look at the monthly statistics that are published. Renault is still selling very few cars a month. I blame not good enough advertising and that stupid face of the Fluence on it. It’s a decent car, with a reliable drive train taken from Nissan, and can be serviced at (some) Nissan SC. It also comes with much better service than is usual at it’s price point. But it has the most boring looking front end, ever, and that includes Toyota and VW. When Samsung Renault has introduced the European facelift (from 2012) in 2014 sales jumped up. But Malaysia is getting the Korean facelift from 2012, that was responsible for poor sales in South Korea. But TC insists on using the old South Korean facelift for the next few years, instead of quickly changing it. Heck, they should have postponed the launch (the European facelift was introduced a couple of months before the car was launched in Malaysia) and change the front end. FRONT WHEEL DRIVE = CROSSOVER ?? Im guessing you don’t get the concept of crossover vehicles. There are many examples of FWD crossovers in the market today and many of them are really popular. CR-V, CX-5, ASX…to name 3. Looks like many more will come in the future, too. looks really good inside though with just the right amount of crazy. Nice engine lineup too, now just hope they bring it in at a nice price, could give the SMax, Sharan and CrossTouran a run for the money. The car looks super cun & I adore the minimalist cabin. 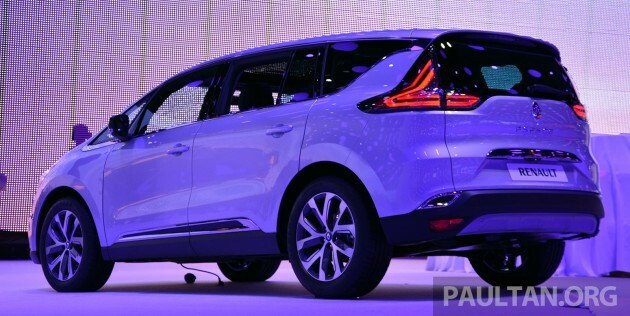 But I don’t think this gonna be as practical & reliable as the Sharan. Sharan is pretty practical but the price is steep. And it looks quite close to the CrossTouran. As for reliability, not too sure about the Vee Dubs as I never owned that specific engine/transmission combo, but for the most part the DSG in that is somewhat reliable, having said that there have been horror stories about it and VGM’s local aftersales that is horrid. Oh yeah I forgot about VW’s DSG..
VW complaint is getting lesser and currently, there are 12 experts from Germany is working at VGM to solve all these gearbox problem. Well.. i think they will fix this issue as soon as possible. Every new european car now come out a interior design like a aircraft cockpit. It may be a crossover, but it looks like it can still seat 7. So they’re crossing an MPV with an SUV. oh and I would like to say “”Viva La France!!!!! Except that it isn’t technically an MPV. It is only not an MPV because Renault doesn’t want to call it that way, because MPVs have a bad rep. Previous Post: AD: Drive home in a new Audi with special financing packages offering interest rates as low as 1.58%!